Posh striker Souleymane Coulibaly misses the friendly at Grimsby. Photo: Joe Dent/theposh.com. New Peterborough United striker Souleymane Coulibaly will miss tonight’s (July 28, 7.30pm kick-off) friendly at Grimsby after receiving an international call-up. The 20 year-old is away with the Ivory Coast Under 23 side preparing for an Olympic qualifier with Zambia. Coulibaly would probably have been involved at Blundell Park as the Posh fringe players are all expected to receive a run-out. The entire first-team squad will travel, but captain Michael Bostwick is likely to be among a strong set of substitutes. Central midfielder Harry Beautyman and centre-back Jack Baldwin are absent because of injury. Central defender Ricardo Santos has recovered from the toe injury that shortened his appearance time in Saturday’s (July 25) 0-0 draw with Ipswich. That result maintained an unbeaten run of summer form for Posh, but they meet a team in equally high spirits tonight. Admission to the game is on the turnstiles at a cost of £10 for adults and £5 for concessions. 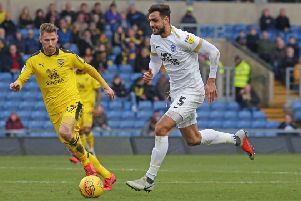 Last season’s Posh captain Jack Payne is back at the ABAX Stadium after League Two side Leyton Orient failed to meet the asking price for the midfielder. Payne played for Orient on their pre-season trip to Spain. Posh have yet to comment on rumours linking the club with a loan move for teenage Arsenal star Dan Crowley. The 17 year-old midfielder is understood to be keen on seeing some Football League action this season.